WVHS senior, Kyle LeDuc, and family visit his favorite football team, the Dallas Cowboys. 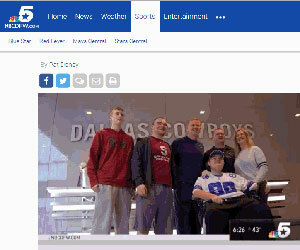 In the middle of their busiest week of the season, head coach Jason Garrett and the Dallas Cowboys found the time Friday to make one fan’s dream come true. Kyle was born with muscular dystrophy and is an inspiration to the Cowboys. As a senior in high school in Warwick, N.Y., Kyle is already working as an assistant football coach and even calls plays from time to time. Friday afternoon, Garrett spent a few moments with Kyle and his family at The Star in Frisco. On Sunday the LeDuc family will watch the Cowboys play the Green Bay Packers in AT&T Stadium, wrapping up a dream weekend for a fan whose perseverance is inspiring to those around him.